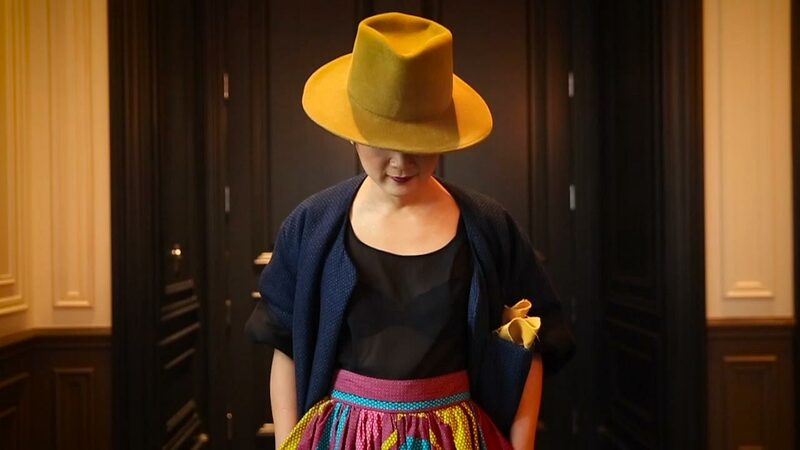 Sheung wears a Brookes Boswell hat, an A Détacher blazer with an oversized piece of fabric folded into a pocket square, a Jenny Rossy skirt and H&M shoes. The PiL concert T-shirt that Rodriguez is wearing is layered with an H&M blazer, vintage suspenders from Klaxon Howl and a leather riding scarf by his wife, Tara Kelly. Kelly also made his trousers for her former clothing label, Las Valentias. The striped socks are H&M and the loafers are Dr. Martens. Ahluwalia wears a Stella McCartney jacket layered over a caped tunic by Sabyasachi Mukherjee and Prps jeans. Her pumps are Christian Dior and her earrings are by Erin Considine from the store Aloja on Toronto’s College Street. Mbaziira found his shirt through Asos and his denim at River Island. Shoes are by John Fluevog and the watch is Domeni Co. The rings were picked up on trips to Indonesia and Hawaii. “First and foremost, my personality is pretty transparent to everyone I get an opportunity to interact with,” says Isaac Mbaziira, a print-loving relationship manager at Chartered Professional Accountants of Ontario. “This allows me to express myself in a way that is pretty much already expected.” Those in corporate roles often relish doing downtime dressing differently from their day-to-day, yet Mbaziira – who favours the quirky shoes of Canadian designer John Fluevog and high-street hip of Topman when it comes to his wardrobe essentials – says he’s been able to tread the line between official and outrageous regardless of his surroundings. “I found a way to combine both styles and make them work within the same environment, so that I am able to still retain my sense of self-expression.” Mbaziira credits his parents for influencing his eclectic sartorial sensibility, noting his mother would encourage him to flip through kid’s boutiques’ catalogues to get a sense of his own style predilections at a young age. “Being born and raised in Uganda, my parents have always been attracted to colourful outfits and that rubbed off on me as I grew up,” he says. These days, Mbaziira looks to the likes of multihyphenate Pharrell Williams and actor Chadwick Boseman for inspiration, and you can see hints of their unique styles in his own novel ensembles. Durocher’s gilt jumpsuit is by her neighbour, Project Runway All Stars standout Evan Biddell. Her vintage pieces include her red headwrap, satin gloves and metal bracelets. Shoes are by Alexander McQueen, the ring is Hestia and the watch is Movado. An Etro blazer paired with an Eton shirt and Hugo Boss tuxedo pants are the backdrop for Lee’s Dion bow tie, pocket square and boutonnière, Nixon watch and Tiffany & Co. cufflinks. The patent loafers are Calvin Klein. On Futher is a Gary Graham dress and Stuart Weitzman boots. “Clean” is a theme throughout Mary Futher’s life. As the founder of eco-beauty brand Kaia Naturals, Futher works to redefine Canada’s skin-care choices; she also favours simplicity when it comes to her own wardrobe – the quick addition of combat boots takes her outfits from polished to playful. Describing her look as “timeless with a dark twist,” Futher sticks to a black palette using pops of colour sparingly – “mostly kept for my lips,” she says. Relying on the appeal of black’s chic mysteriousness, it’s no surprise that Inès de La Fressange, the French fashion muse, is one of her icons, as is Linda Rodin, the skin-care entrepreneur and former model whose hallmark style includes a pair of eye-catching glasses; Futher’s own bold black frames have become a signature of sorts for her as well. Their commanding presence plays off structured garments from COS and Canadian fashion icon Lida Baday – Futher’s go-to brands – with fabulous finds from designer resale shops such as Rewind Couture taking residence in her closet, too. Futher also indulges in the occasional trip to New York’s Century 21 store, noting that “you never know what you are going to find!” While she considers her all-black-everything look a uniform, there’s certainly nothing standard about it. A vintage suit jacket is tucked into Thompson’s matching trousers and cinched with a vintage belt. The turtleneck is by Ermanno Scervino, the chain bracelets are by Lisa Corbo Design and Celine created the bracelet on his left wrist and the white sneakers. For a fashionista with a cultured eye, working at the George C boutique in Toronto’s tony Yorkville neighbourhood has more benefits than proximity to stylish apparel. It’s also a natural starting point for exploring the city’s most inspired locales. “I spend a lot of time finding conceptual spaces, whether it’s shops, art galleries or somewhere to grab a drink,” Maxwell Graydon Thompson says. Raised in the cottage country of Ontario’s Muskoka region, 20-year-old Thompson has winter dressing down to a science. “I couldn’t live without my vintage Max Mara coat, it’s like a blanket,” he says. At work, Thompson favours practical pieces such as white sneakers and turtlenecks, but after hours it’s a different story. “I definitely like to dress more impractically, like an oversized sleeve that I can barely text in, or boots with a heel just high enough to slow me down.” Some of his statement pieces include a mint-green suit with matching beret and a rhinestone-covered black velvet jacket. “One thing in life I will always appreciate is a fully thought-out, head-to-toe look.” It’s a level of commitment that Thompson is certainly not one to shy away from. For her own Halifax-based label Maggie Jayne, MacCormick created these zip-up overalls. The top is Marigold by Marilyne Baril and the boots are by Paloma Wool. Slate and Stone Jewelry created the ring and sculptural earrings. Montreal-based Marie Saint Pierre created Olson-Mottahed’s dress. The sequin boots are Christian Louboutin and her tights are La Perla. A “Loved” palm cuff and the arrow ring are by Gucci. When you spend your youth flipping through Vogue, Elle and Harper’s Bazaar, the likelihood of a style fixation creeping into your adult life is quite high. Katrina Olson-Mottahed, Calgary-based content creator and director of the Canadian International Fashion Film Festival, not only indulges her fascination with fashion through her career, but also by treating herself as a walking work of art. Olson-Mottahed can be seen sporting pieces from brands ranging from Fendi to Montreal’s Unttld and Marie Saint Pierre, and she counts fashion-forward e-commerce site Ssense as a go-to shopping destination. Though Olson-Mottahed is a devoted champion of design – “[I hope] my style shows that I deeply appreciate the designers who make beautiful pieces” – she’s undertaken quite the challenge for a fashionista. “I am having a sustainable 2019, which means I will do absolutely no shopping for this entire year,” she says. “I am taking a year to really appreciate what I have and work my pieces into my life.” While she can rock her treasured wild Gucci accessories on an evening out, Olson-Mottahed admits her workday wardrobe leans on more classic accents. “It is easy to look put together when you cover up with a beautiful coat, big sunnies and a nice handbag,” she notes. To compile this list, a group of Globe and Mail editors and contributors (Caitlin Agnew, Odessa Paloma Parker, Andrew Sardone and Maryam Siddiqi) reached out to their networks of wardrobe watchers, dug deep into their social-media feeds and surveyed 2018's honorees to create a roster of candidates from across the country. After narrowing the nominees down to 10, the group gathered at the St. Regis Hotel in Toronto to be photographed. Think we missed the mark and have a best-dressed suggestion of your own? Post a photo of your fashionable contender to Instagram and tag the picture @globestyle and #GlobeStyleBestDressed. Marriott's St. Regis brand was established as a place for special gatherings. Its opulent Midnight Suppers, which are hosted by a celebrity and typically gather an intimate crowd of the host city's social setters around a table, is the most exclusive example of the hotel's knack for bringing people together. Fashion designer Jason Wu hosted one of the dinners at the hotel's Toronto location in December, 2018, but today, it still offers plenty of places to spend a night out. The luxe Astor Lounge, the hotel's lobby bar, kicks off social hour daily at 5 p.m. with a Champagne sabering, while up on the 31st floor, in the bar and restaurant Louix Louis, signature cocktails are shaken up under a custom mural inspired by the warm colours of whisky. At meal time, save room for the restaurant's indulgent 13-layer chocolate King's Cake. A piece is meant to be shared, so you might want to bring some friends. For more information, visit marriott.com. Writing by Caitlin Agnew and Odessa Paloma Parker. Compiled by Caitlin Agnew, Odessa Paloma Parker, Andrew Sardone and Maryam Siddiqi. Photography by Nathan Cyprys. Video by Melissa Tait. Art direction by Benjamin MacDonald. Fashion editor: Odessa Paloma Parker. Makeup and hair by Ronnie Tremblay for P1M/Nars Cosmetics/Oribe. Photo editor: Rachel Wine. Digital production by Jeremy Agius.